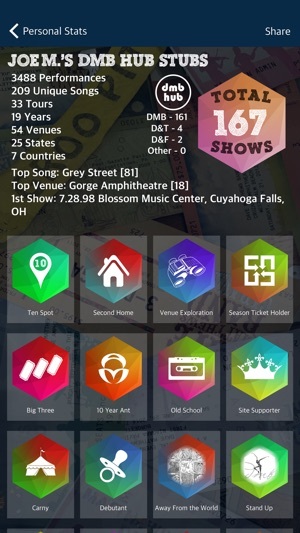 DMB Hub from antsmarching.org is the quintessential mobile experience for the Dave Matthews Band fan. At the core of DMB Hub is simply “The Hub” - a one-stop list of all the current happenings in the DMB world. 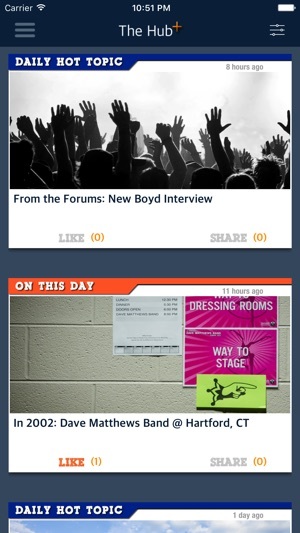 You’ll find daily DMB history updates, top discussion threads, breaking alerts and other bits of information. All intended to keep your finger on the pulse of the DMB community. Of course, the heart of antsmarching.org is Tour Central, and DMB Hub is a simply beautiful way to explore the band’s entire live catalog. Browse year-by-year, and when you find a show you’re interested in, you just tap to view the setlist. Or, leverage 3D touch to “peek” at a show, and if you’re interested, “pop” it. 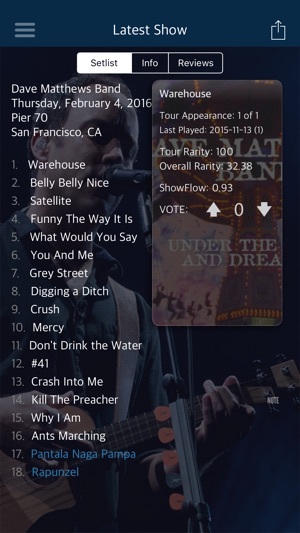 DMB Hub not only leverages Tour Central to show you setlists, but also contextual information about each show. Tap on any song, and a pop up will display, giving you information about that specific performance of the song. Like to get personal? 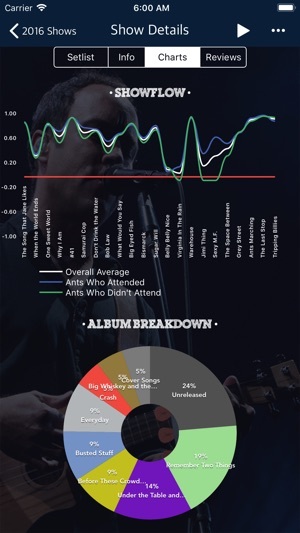 Log in with your Ants account and track your personal show history and statistics. You can even add shows to your attendance list right from the app. Have a complete catalog of your history with the band right in the palm of your hand! And have even more fun sharing with DMB Hub Stubs! Earn "stubs" based on your tour superlatives! DMB Hub also knows when a live show is going on. When you’re viewing the live setlist, tap any of the songs played so far to pull up historical information on the performance. When was this last rare song played? How many shows has it been? Has it ever been played at this venue, and when? It’s simply magical. Like to challenge your mates for bragging rights on who can best predict what the band will play? 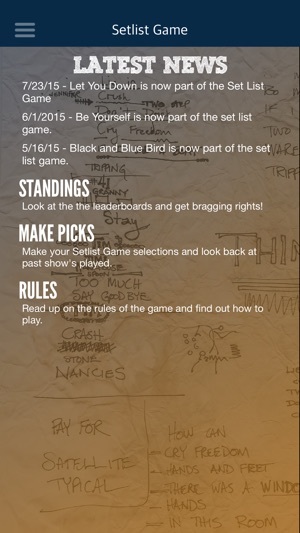 The Setlist Game is for you. Now you can get your picks in on the go without having to worry about rushing home to beat the deadline. Have an Apple Watch? DMB Hub enables you to pull up the latest (or live!) setlist right on your watch. DMB Hub from antsmarching.org. An incredibly powerful and unparalleled DMB fan experience. It’s our best DMB Hub app ever. Check the forums for the latest! This is the greats app out there for any music fan who loves DMB. From keeping stats of the shows you went to and being able to listen to streams of shows throughout the concert tour to going back to your past shows to feel nostalgic about old setlists. This app has everything a DMB fan could ever want. It’s currently the best app on my phone that isn’t a navigator haha. Did I mention you can LISTEN TO THE STREAMS WHILE THE APP IS CLOSED!!! Great app!! 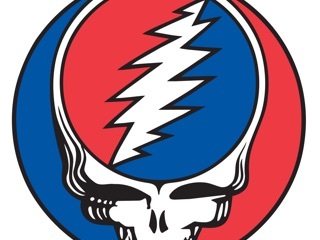 I download this app but to use it you must register with a DMB forum called Ants Marching. They want some personal info like your personal email. No big deal? Well once you register and use their website, they ban you and the message says, you are banned. Date the ban will be lifted...never...reason given for ban...none. Very shady. When you google the website, there are a lot of warnings about the abusive moderators. I am deleting the app because without the website registration it just takes up space. Too hard to use and register twice. Site registration is not required to use this app, nor does it collect personal information. This "review" must be from a user who was banned from the website and has an axe to grind. An amazingly convenient app for any DMB fan. From live set list updates, to keeping track of your attended concerts or even listening to those shows shortly thereafter, this app is clearly created and maintained by fans. The effort that has gone into this is evident and the admins should be commended. Fantastic job and thank you from all of us.